The LaCie 2big Thunderbolt Series is an external desktop RAID system that uses two 3.5-inch, 7200-rpm drives pre-configured as RAID 0, but you can reconfigure as RAID 1 or JBOD using OS X’s Disk Utility application. The 2big has a pair of Thunderbolt ports, which makes it easier to incorporate in a Thunderbolt daisy chain. Unfortunately, it has no other ports, such as FireWire or USB, so it can’t be used with older Macs that don’t have Thunderbolt. At the time of this review, the Thunderbolt version of the 6TB 2big is $100 more than the quad-interface version, which has FireWire 400, FireWire 800, USB 2.0, and eSATA. A model with a pair of 2TB hard drives is available for $649. The aluminum case draws heat away from the drives inside, but LaCie included a fan ensure that the mechanisms don’t overheat. It’s easy to access the two 3TB Seagate Barracuda hard drives. To see how fast the Thunderbolt 2Big is, we ran a series of tests with it attached to a 17-inch 2.4GHz Core i7 MacBook Pro with an internal 250GB SSD and 4GB of RAM. When copying a 10.7GB file from the internal SSD to the 2big, we saw write times of 217.5MB per second. When copying a 10.7GB folder with 7427 files, we saw a write speed of 191.7MB per second. When copying the 10.6GB file and 10.7GB folder back to internal we saw read speeds of 182.8MBps and 148.6MBps, respectively. The 2big’s write speeds were a touch faster than another Thunderbolt drive from LaCie, the Little Big Disk Thunderbolt Series SSD ( ); the SSD-based LaCie was a bit faster than the 2big in the read tests. LaCie also has a hard drive version of the Little Big Disk Thunderbolt Series( ) that we’ve tested, and we’ve also looked at the Promise Pegasus R6 Thunderbolt array. When comparing the Thunderbolt devices we’ve tested, the results from the 2GB File test and 2GB Folder test were flat, with the slowest device being the hard drive version of the Little Big Disk Thunderbolt series (pointing to the internal SSD as a bottleneck in those tests). Using AJA’s System Test, we see bigger performance differences between the drives, with the six-drive Pegasus coming in 76 percent faster the the write test and 73 percent faster then the 2big int he read test. The Little Big Disk SSD was 58 percent faster at the read test than the 2big, but the 2big was about 20 percent faster in the write test than the Little Big Disk SSD. When comparing the speed of the 2big to the Seagate GoFlex Desk ( ) 4TB with the FireWire 800 dock attached, we see that the internal SSD is not the bottleneck in that testing. The 2big was nearly three times as fast at writing files and folders and a little more than twice as fast as that drive reading the same data. The AJA System test showed the 2big to be about four times as fast as the Seagate writing and 3.5 times as fast reading. All scores in MB per second. Larger number is better. Best results in red. 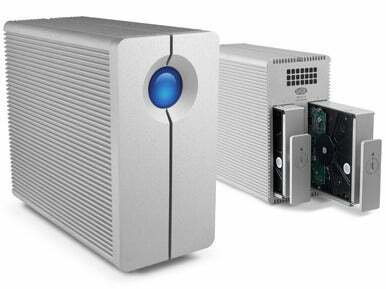 With 6TB of storage and fast Thunderbolt read and write speeds, the LaCie 2Big Thunderbolt Series drive offers fast speeds for backup or video processing. Like all other Thunderbolt drives we’ve seen, the 2big doesn’t offer any other ports for connecting to older Macs or PCs without Thunderbolt.